When I bought this book, I believed that I was buying the second book in Victoria Laurie Ghoul series. I wasn’t into very far when I realize something was wrong. I finished and have given it 5 stars because it deserves it. However, I won’t be reading more of this series as I felt the violence and tragic scenes more than I like. I also could tell what would happen as the story progressed. There is nothing new about a bully who uses the gun to enforce his wishes. I seldom make a mistake like this and I will read the 2nd Ghoul book. Psychic eye Abby Cooper has the ability to read tarot cards and be right. A mob leader discovers her talent and demands she works for him. Abby refuses and the pursuit is on. The story takes several twists and turns as Abby tries to outwit him instead of seeking police help. 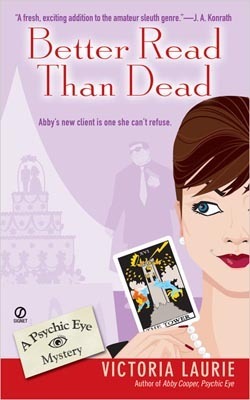 This entry was posted in Books and tagged Abby, mob, paranormal thriller, physic, Victoria Laurie, volience. Bookmark the permalink.